It sounds like the start of a joke but a Canadian woman gave birth over the Pacific Ocean while en route from Calgary to Tokyo. The 23-year-old mom went into labor and fortunately there was a doctor on board who helped deliver the healthy baby girl, reported AFP on Monday. Air traffic control at Narita International cleared the flight for an early landing, about 30 minutes ahead of schedule, and mom and baby were whisked to hospital where all was reported well. Since mom is Canadian, the baby is too, so that should put to rest the questions of nationality. The other issue it raises is what the rules are for traveling while in the late stages of pregnancy. It’s not clear how many weeks along the woman was, but generally, the rules about flying while pregnant are based on an honor policy. 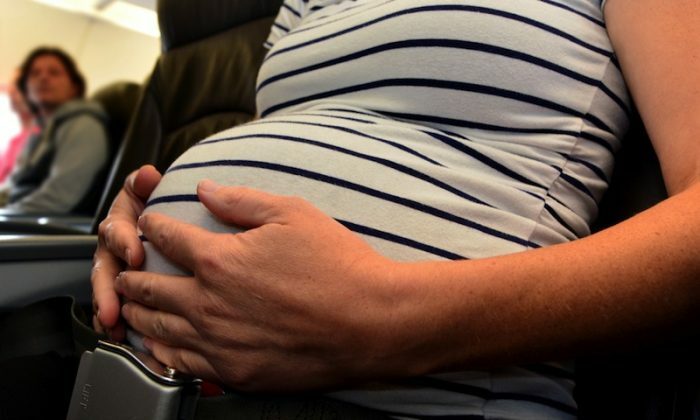 On Air Canada, the carrier in this case, a woman with a normal pregnancy with no history of premature labor, can travel up to and including her 36th week (4 weeks from due date), according to the airline’s website. There are no stated requirements for a doctor’s letter and Air Canada doesn’t make a distinction between domestic and international travel, which some other airlines do. Many U.S. airlines are less restrictive about dates, but often require a current “permission-to-travel” letter from a doctor, so it’s generally advised to get one if flying in the late stages. Delta and Alaska Airlines, for example, have no restrictions at all, and simply advise consulting with a doctor before flying. American Airlines doesn’t put any restrictions either, but asks for a doctor’s letter if in the last month for domestic or international travel. JetBlue, US Airways, and Virgin allow travel within seven days of the due date, with a doctor’s letter. And of the three, only Virgin has stricter rules for international travel, requiring proof of due date between 28 and 36 weeks, and no flying after that. Forget plane crashes—statistically, you're far more likely to suffer a car crash, or even win the lottery—but planes can have serious effects on your health.